Next Tour date is September 16, 2017. The Masonic Theatre Preservation Foundation was formed in 2009 and its main goal was to preserve and protect this valuable community asset. Years of fund-raising ensued and in April 2015, reconstruction began on the Historic Masonic Theatre with all funding in place and historically accurate architectural drawings focused on restoring the original elements and beauty of the 1905 Theatre. The 6.7-million-dollar renovation has rehabilitated all four floors of the Theatre, the third-floor ballroom warming kitchen and studios, the balcony level with offices and conference room, the auditorium with stage and lobby, and the lower level dressing rooms, concessions and underground lounge that looks out onto Smith Creek. The Theatre stands as a testament to the vision of earlier citizens of the area who sought to foster educational and entertainment opportunities as well as community fellowship. The Historic Masonic Theatre holds a special place in the hearts and minds of a supportive community and it looks to the community to keep it strong and vital for years to come. 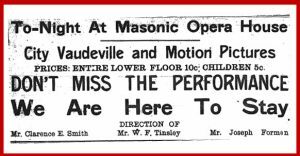 Plan your tour of the Theatre – Learn more about the Historic Masonic Theatre and their story. Visiting Clifton Forge is easy with Interstate 64 exits at each end of town. AMTRAK provides connections to D.C., Chicago & New York. At the west end of Town is Dabney S. Lancaster Community College and on the east end scenic Douthat State Park. Arts & Entertainment abound in our community. The Clifton Forge School of the Arts stands just across the street from the Historic Masonic Theatre complex. The Alleghany Arts and Crafts Center and the C&O Railway Heritage Center are both a short walk from the theater’s front door. Enjoy downtown shopping, one of many eateries such as the renown Jack Mason’s Tavern. The Tavern is also opening their brewery later this Fall. Enjoy fine dining at Cafe’ Michel. Vic’s family restaurant continues to be a mainstay for residents and visitors. You will love the small town feel, friendly citizenry and strolling the community and The Historic District. We invite you to visit. You may just decide to live here in CFVA.